Welcome to my guide to Ymir, Father of the Frost Giants! Before we start, I would like to mention that this guide participated of the Smitefire's Ymir Guide Contest and became a Runner up! This is my first Smitefire guide, and I would appreciate feedback, as I'm constantly updating it; So feel free to comment - it greatly helps. Regardless, lets move on to the big snowman himself, Ymir! Frostbite procs with all your damaging abilities, so use use a basic attack between them. It truly deals awesome damage. 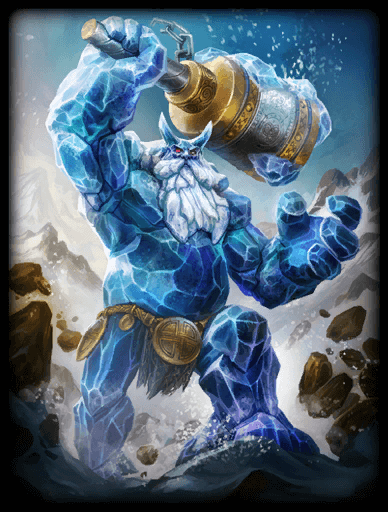 Ice Wall can be painful, either for enemies or even for Ymir's allies if used incorrectly because this ability requires good aiming and timing. However, remember that this ability takes some time to actually spawn the wall, so be cautious when placing it. You can also place it in front of you when running of someone (Just be sure that you aren't slowed and are with tier 2+ shoes). Level this ability last because the extra seconds it provides doesn't help as much as the extra damage and stun time that your other abilities do. Glacial Strike is your main wave clear that also slows enemies. Remember that, as Ice Wall, this ability takes some time (around 0.5 seconds) to actually "spawn". Level this ability secondly because this is your main wave clear, so leveling it is very important. Frost Breath is your only hard CC, and because of this it is VERY important to not miss it. It's also good for canceling abilities such as Thor's Berserker Barrage. You should use it mainly to set up kills for your teammates, or even to save them/you. Using it to clear wave isn't a goood idea, though. Level this ability thirdly because, while it helps on aggressive and defensive scenarios, it doesn't help your wave-clear - and that's very important on season 4. Shards of Ice is one of the strongest abilities in the game, dealing 1100 (+150% of your Magical Power) at maximum rank. However, it needs to be very well timed because it needs 3s to maximum damage (however, remember that you can cancel it at any time, with reduced damage), and you aren't immune from damage during this period, so only use it when NOT out of position. Also excellent for securing objectives. Level this ability whenever you can because it is truly a game-changer and a perfect objective secure/steal. Block your enemie's path with Ice Wall, then, while they try to turn around it, you use Frost Breath to keep them in place and then Glacial Strike to slow them and also to deal damage. You should also attack them with AAs inbetween abilities. this, use Shards of Ice. Note:Maybe you will have to cancel your ult before it reaches its maximum power. Watcher's Gift is a must for any support, for both agressive and defensive ones. You could also buy Mark of the Vanguard for early tankiness, but then you would rely on kills and on clearing minion waves, making farming harder for your ADC. P.S. : If you didn't know, you are going to sell this late-game for a 6th item. Travelers Shoes is more important now than on the last season because there are so much to contest now. It provides you with poor damage and normal MS, but whenever someone buys it its because of the passive, that helps your rotations, gives you more gold and HP5. However, if you buy it your build will lack Mana and CDR until you replaces it for Shoes of Focus, so going for Breastplate of Valor and/or Shogun's Kusari surely helps you. If you bought this item, you will then replace it for Shoes of Focus late-game. Shoes of Focus provides two important things that Ymir likes: Mana and more importantly, CDR. This shoe helps you for the entire game, so it is a MUST for your build. It's recommended to buy it later, though (By swapping Travelers Shoes for it). Sovereignty is one of the most powerful support items right now, as it provides 60 protections (only 5 less than BoV), health and HP5, along with an amazing passive that makes your entire team more tanky, helping on aggressive and defensive situations. Also helps your team to tank minions and towers. Heartward Amulet isn't as good and popular as Sovereignty because it doesn't help to tank towers and minions, but that doesn't means that it is a bad item. You should consider this over Sovereignty if there are 3+ magical gods in the enemy team, or if they have a magical jungler such as Ao Kuang or The Morrigan, or even if you have 2+ very mana-hungry teammates. Gauntlet of Thebes provides less selfish defense but gives both types of protections to your teammates, along with a TON of health and even a little MP5. Should always be considered. Here, you will buy one physical-protection item and a magical one. The order that you are going to do so varies if there are more physical or magical gods on the enemy team, with the dominant type of damage being prioritized. Breastplate of Valor is a great choice for any support build. Along with excellent defense, it also provides mana and CDR, two very important stats. Dynasty Plate Helm is a good item for agressive support builds because it provides a good mix between offense and defense, along with flat penetration that will greatly help your damage early game. Bulwark of Hope is one of the most complete defensive items right now, as it provides 320 effective health, 20% CCR and a great passive that allows you to continue in teamfights longer without dying. This shield is perfect for surviving because it will allow you to survive from both types of damage. Shogun's Kusari Is the alternative to Breastplate of Valor if you want magical protections but still wants CDR and Mana/MP5. Also has a passive that helps your entire team. Almost a MUST if there are 2+ AA-Based gods on your team. Hide of the Nemean Lion offers an incredible amount of Physical Defense, along with 200 Mana, MP5 and a good passive. Plus, works incredibly well against hunters and assassins building crit. Midgardian Mail is not my favorite item for these situations, and between it and Hide of the Nemean Lion, I would choose the latter. However, this item offers more team-oriented utility than Hide of the Nemean Lion, along with some decent health. Witchblade counters AA-Based Gods in such way that you don't need to do absolutely nothing for this effect. I would suggest picking this over Hide of the Nemean Lion or Midgardian Mail if there are 2+ AA-Based Gods on the enemy team or if there are hunters building Qin's Sais. Also counters healing. Pestilence offers a ton of magical defense along with a good chunck of health, and an aura passive that works by itself. While its anti-healing effect is one of the weakest by numbers, it covers a wide area and doesn't need to be applied by external uses (such as AAs, abilities). Can also be bought as 3rd or 4th item instead of Bulwark of Hope, Shogun's Kusari or Void Stone if you need quick magical protections and anti-healing. Divine Ruin provides good magical power and some little penetration (two good stats on Ymir if you want to be more agressive), along with a passive that gives you nice counter-healing. Witchblade may be somewhat difficult to proc with Ymir, but it rewards you with nice healing reduction, and synergises well with your passive. Also counters AA-Based Gods. Winged Blade is the only item that counters slows apart from Heavenly Wings and is a MUST if there are gods with area slows such as Kukulkan and Poseidon and/or if there are any mages building Gem of Isolation. Stone of Gaia is the only item that counters knockups apart from Phantom Veil and is a MUST if the enemy team has gods such as Sylvanus, Bacchus, etc. Can also be bought for the sustain. Spirit Robe provides not only a way to counter CC to your build, but also CDR that will certainly help you. I would suggest buying this item if you need additional CDR or if the enemy team has a lot of CC. Note: Before you ask it, I'd NEVER suggest buying Magi's Blessing over Spirit Robe on Ymir, as it doesn't provide any additional CDR, and gives you low defense and a bad passive just for a little less money. Mantle of Discord provides not only a huge boost to your defense, but also provides CDR and a good passive. You should consider this item if you need these things or just if you want to be more tanky. Spear of Desolation provides you a ton of important stats for a decent price: Power, Penetration, CDR and a passive that increases your survivability and kill potential. It's overall a very powerful item and should be considered if you want more to offer more utility and damage to your team. Mark of the Vanguard provides a bunch of helpful things: Physical protection, health and a passive that will let you survive more "pokes" on the early game. Shoes of the Magi is being bought here because we already bought a defensive item ( Mark of the Vanguard, for early tankiness), and now we can invest in damage. This shoe is perfect for this, because it not only gives you damage, but mainly flat penetration that will greatly help your early game. Buy this item if you are against a physical lane enemy. Breastplate of Valor is a great choice for any tank/bruiser build. Along with excellent defense, it also provides mana and CDR, two of the things Sobek most needs. Buy this item if you are against a magical lane enemy. Bulwark of Hope is one of the most complete defensive items right now, as it provides 320 effective health, 20% CCR and a great passive that allows you to continue in teamfights longer without dying. The shield also protects you from both types of damage. Buy this item if you are against a healer lane enemy. Pestilence should only be bought as 2nd item if you are facing a god with huge heals (such as Chaac, Hercules and Tyr). It's also the only counter-healing option here because it is the most appropriate for the laning phase. Also, works even better if the enemy team has 2+ healers. Dynasty Plate Helm is a good bridge item for magical solo-laners because it provides a good mix between offense and defense, along with flat penetration that will greatly help your damage output early game. Buy this item if you bought Pestilence as 2nd item AND you are facing a physical healer lane enemy. Void Stone provides a good mix between magical defense and damage. It is important in this build because in the Solo lane your enemy will be counter-building you 90% of the time, so the defense reduction helps a lot and indirectly gives you more damage (Along with 40 Magical Damage that this item offers). Pestilence offers a ton of magical defense along with a good chunck of health, and an aura passive that works by itself. While its anti-healing effect is one of the weakest by numbers, it covers a wide area and doesn't need to be applied by external uses (such as AAs, abilities). Can also be bought as 3rd or 4th item instead of Bulwark of Hope or Void Stone if you need quick magical protections and anti-healing. Stone of Gaia is the only item that counters knockups apart from Phantom Veil and is a MUST if the enemy team has gods such as Sylvanus, Bacchus, etc. Can also be bought for the sustain, that helps a lot on Solo Lane (Even more if you bought an item that offers health). Spear of Desolation provides you a ton of important stats for a decent price: Power, Penetration, CDR and a passive that increases your survivability and kill potential. It's overall a very powerful item and should always be considered. Pythagorem's Piece provides a good amount of power, CDR, lifesteal and mana. Not only this, but a passive that helps your entire team, independently of them being physical or magical. It's not like a weaker version of Spear of Desolation, but a cheaper - and team-based item. Should always be considered. Book of the Dead has somewhat similar status to Soul Reaver, as it provides you with the same amount of power but health instead of mana. Also, it provides lifesteal and a passive that may grant you a good amount of shield. If you need more tankiness but also lifesteal, then buy this item. With this build, the shield can scale up to almost 600 health if you build with 3+ items with health. Obsidian Shard provides not only power, but also penetration. This item will let you hit even more hard with your abilities and to heal yourself more. If you want all these things, then buy this item. Teleport Glyph offers quick travel to lane and makes farming easier for you. Should only be bought if playing in Solo lane. Also helps to stop split-pushers such as Loki, Bastet and Skadi. I suggest picking this relic as first because while it still has its uses mid to late game (if your team is properly warding), early game is where it really shines because it helps farming a lot. Meditation Cloak is one of my favorite relics because it offers more sustain to you and your allies, making it easier to stay in lane, survive ganks and to not die. Just remember that you already have a heal and a mana-regen ability. Also, if you are playing as Support, it greatly helps if you are with a Mana-hungry ADC. I would suggest picking this relic first because it doesn't help so much mid to late game. Also good if your lane enemy(ies) has(have) good sustain. Horrific Emblem, similar to Heavenly Wings, can be used to chase or to escape from enemies. Not only this, but it also provides a attack speed debuff to the entire enemy team if used correctly. Because of that, you can also use this relic on teamfights if there are AA-Gods nearby. I suggest picking this relic on level 12 because it is not so useful early game, but provides a lot of uses mid-late game. Cursed Ankh provides a huge healing debuff and should be picked if the enemy team has heavy healers and/or more than one of them. I suggest picking this relic on Level 12 because, while it might help you if against Terra or Sylvanus, for example, it provides much more used mid-late game. Heavenly Wings is a good relic for chasing or to escape from enemies. I would suggest buying this relic if your ADC doesn't have an escape (Assuming you are playing support) and/or an enemy bought Horrific Emblem. This relic can be picked in any stage of the game. Magic Shell is one of the best relics for teamfights as it provides temporary defense for your entire team. You should always consider this relic. Phantom Veil provides a ton of uses and can help you in many situations. Yet, it is a situational relic and should only be picked if needed, like if against Sylvanus or Odin, for example. BLUE Wards are those that should be placed whenever possible, in any situation. RED Wards are Sentry Wards that should be placed to secure that the enemy doesn't take objectives. You will Sentry-Ward Gold Fury on the Early ~ Mid Game if your team hasn't killed both Oracles, along with the Portal Demon as soon as it spawns. You also must ward the Fire Giant on the Late-Game. 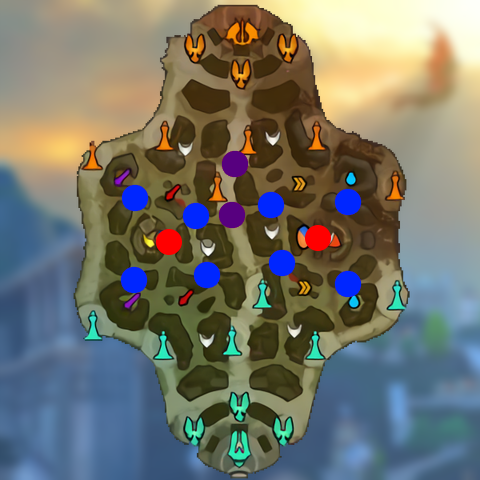 PURPLE Wards are Wards that should be placed if the enemy team is heavily rotating around mid-lane. Remember: you can't ward the entire map. Everybody must ward. On the early game, focus on warding around your lane and maybe the Gold Fury if it seems that she is getting much attention and your team hasn't killed both oracles. Then, on mid to late game you should focus on warding the Gold Fury, the Fire Giant and the Portal Demon. You can also ward lanes that are being heavily ganked if needed. At the very start of the match, buy your items and go straight to the Duo Lane, clear the first wave with your ADC and then go for the Reduction buff (You may also steal the enemy buff if you and your ADC have some early clear advantage). You may then go for the Damage buff and give it to your mid-laner. Ymir has a powerful but risky early game (Mainly because of his amazing clear and his kit, that punishes low-mobility gods) that needs to be played carefully. While you can't solo-kill someone, your teammates don't need to put much effort to finish 'em. Ward around duo/long lane at the very start of the game and be careful to upcoming ganks (They aren't common to happen in this lane at this stage of the game, though.). Don't forget to pick the Reduction buff and to rotate (So that your ADC won't lose XP) when you hit level 5-7 or simply when your ADC can easily clear the wave alone, and then place 1 or 2 Wards around your lane before leaving. Also NEVER finish minions - unless your teammates aren't in lane, because they need to farm and you already have Watcher's Gift for this. You should also buy 2-3 Multi Potions and a Chalice of the Oracle on your first backs, maybe after your second item. Here, you will start to buy one Sentry Ward when back to base (Along with the Chalice of the Oracle that you already should have). Sentry Ward the Gold Fury and be sure to kill the oracles with some of your teammates if you got the opportunity. Heavy rotations start here, so make good use of them so that you help every lane that is needing of you. You can also help your jungler to clear camps and ganking between rotations. Don't forget to Ward the Portal Demon if anybody did it. In this stage of the game, you will focus on initiating teamfights and CCing the enemy team. NEVER forget to Ward the Fire Giant and the Portal Demon. Remember that you must try to CC a lot of enemies at once when on teamfights. At the very start of the game, go to the lane with your jungler and clear the first wave. Then, you can go for the Fire Imps, the Mana buff and the Speed buff, in basically any order. Invading the enemy side of the jungle is also an option. After this, you should focus on clearing the waves while poking your enemy and to either clear the Mana buff or the Fire Imps when capable of doing it. Only back when with low health and/or with enough gold to buy a tier 3 item, and never back whithout clearing the wave, your buff and the imps (Unless you are with low health/mana). If ganks start to occur, you can buy Wards along with Multi Potions if you're willing to. You should also buy the Chalice of the Oracle when with enough money. Rotations aren't mandatory, nor recommended. This stage of the game is pretty much like the early game for solo-laners, with the difference that proper fights with your lane enemy are more common and there aren't any Fire Imps anymore. You can now rotate more often if you already cleared your lane and buff. You should also start to buy one Sentry Ward along with the Chalice of the Oracle. In this stage of the game, you may act more like a secondary support or a deadly killing machine if fed enough. Remember to stay with your team and to help teamfights, and to put some Wards around the Fire Giant and the Portal Demon if anybody did so. Ares is an agressive and predictable god that relies on Blink Rune for being truly useful. So, assuming he doesn't choose it as his first relic (He probably won't, because he is one of the least tanky guardians), you are a good counter to him because you can interrupt his Searing Flesh with Frost Breath and prevent him from initiating with his ultimate/shackles by simply doing your combo. Plus, he doesn't have an escape, and you can easily block him with your 1. Ares' usual combo is: Shackles > Searing Flesh, with Bolster Defenses and No Escape being used whenever in need of it. As stated before, you can interrupt his flames with Frost Breath (Looks like Pokemon), so baiting his shackles ins't that of a big deal, as the cripple won't affect you anyways, but it is still something that you can try to do. Athena may prevent you from initiating with her taunt, but you can also freeze her when she uses her dash. However, she has much more mobility than you with a little less damage, but can still be tanky. There's really not too much of counters here. Athena's usual combo is: Confound > Shield Wall, or Defender of Olympus > Confound > Shield Wall, with Preemptive Strike being used whenever she's in need of escaping/chasing. As stated above, you should be careful with Counfound because you need to be close to initiate and you are very slow, so going on position again can be difficult. You can also prevent her from initiating by using Frost Breath before she uses her taunt. Possible counters:Travelers Shoes, Rallying Ritual. Bacchus is an agressive god, so you need to interrupt his combo. When he uses Belch of the Gods you have to freeze him and outdamage him. Plus, he needs to use his jump agressively, so he probably won't be able to jump above your wall unless you are trying to escape. but, in general, Ymir wins, if played correctly (just wait for him to initiate). Bacchus usual combo is: Belly Flop > Belch of the Gods > Intoxicate, or Belch of the Gods > Intoxicate > Belly Flop, with Chug being used between abilities. As stated before, you can easily interrupt Belch of the Gods with Frost Breath, just be careful of Belly Flop. Possible counter: Phantom Veil, Stone of Gaia. Cabrakan is not often seen in the support role, as there he's not much of a dangerous enemy, assuming that you can properly avoid his main damaging tools and his ultimate. Cabrakan's usual combo is: Refraction Shield > Seismic Crush > Tremors, or Tectonic Shift > Refraction Shield > Tremors (Note that his abilities can be used in literally any order). He is not a dangerous enemy to you because, as he needs to get close to you, you can use Frost Breath before he does anything else. Also, if he uses Tectonic Shift when far away from you, you can place an Ice Wall on the open gap of it and AA one of his walls to get out of that death cage. Possible counter: Phantom Veil, Horrific Emblem, Flickering Ritual. Fafnir has no direct counter to you apart from his leap, plus not needing to be close to initiate. Considering these factors, I think that Fafnir would win. Fafnir's usual combo is: Cursed Strength > Underhanded Tactics > Dragonic Corruption, with Coerce being used on his ADC whenever needed. There's really anything that you can do to ruin his combo other than use your ultimate when he uses Dragonic Corruption, as it has a fairly long set-up. Geb is a defensive support, so you must be careful when initiating, as he is one of the best disruptors in the game. Geb's usual combo is: Roll Out > Cataclysm > Shock Wave, or Roll Out > Shock Wave > Cataclysm, with Stone Shield being used when needed. As I said before, He is a perfect disruptor, as he can bait Frost Breath with Stone Shield and stop your combo with Cataclysm. He can also easily escape from your ultimate and save his allies from it. Possible counters: Phantom Veil, Heavenly Wings or Horrific Emblem. Khepri is a defensive guardian that uses Abduct for initiating, so you need to prevent it and proceed with your regular combo. Just be sure that you won't be rooted by Solar Flare. Oh, and try to bait his ultimate too, because he can easily save an ally from your ultimate. Khepri's usual combo is: Solar Flare > Abduct, with Rising Dawn and Scarab's Blessing being used when needed. You must try to avoid being rooted at all costs, and if you fail to, you can place an Ice Wall in your front to prevent being abducted. Kumbhakarna is an agressive support like Ymir, with the difference that he has the most CC out of all gods in Smite. Be careful of him, as he can use Mighty Yawn after you wall him and before you use Frost Breath. Kumbhakarna's usual combo is Mighty Yawn > Groggy Strike or Epic Uppercut > Mighty Yawn > Groggy Strike, with Throw Back being used either for wave clear/poking or as a pure damage tool. There's actually nothing you can do to stop him, he has so much CC that the only thing you can do is try to not get caught and ignore him. Possible counters: Phantom Veil, Stone of Gaia. Kuzenbo is geared towards putting people out of position, while you excel at punishing those that get out of it. His waveclear is worse than Ymir's, and his CC is harder to apply. However, he can use 2 abilities to escape and Shell Spikes can be used to kill hunters with ease late game. Kuzenbo's usual combo is Nene Kappa > Sumo Slam > Watery Grave, with Shell Spikes being used between the combo when needed. You can't do much against his combo but try to dodge Sumo Slam ( Ice Wall may help you with this). You can also use Shards of Ice to prevent being knocked back by Watery Grave. Sobek may be able of using his ultimate to escape from the slow of Shards of Ice, but you can freeze him while he tries to initiate. You also has better wave clear but no sustain. Sobek's usual combo is: Charge Prey > Tail Whip > Sickening Strike, with Luring in the Waters being used when needed. To ruin his combo, you must try to prevent him from hitting his pluck, so that he gets out of position and you proceed to combo him. Sylvanus is a passive god with very low mobility that can simply be destroyed by your kit. Just be careful of his strong ultimate, early game wave clear and strong sustain. Sylvanus' usual combo is: Verdant Growth > Nature's Grasp > Wrath of Terra > Wisps. It is somewhat easy to counter it, you just need to be sure that he will miss his Verdant Growth and then you can agress on him. Possible counters: Phantom Veil, Stone of Gaia, Cursed Ankh. Terra has some sustain in lane, an escape and a team-based ultimate. However, you have better wave clear and safest ways to agress with Ice Wall. Terra's usual combo is: Monolith > Force of Nature (throught the monolith) > Force of Nature (throught you) > Crushing Earth, with Terra's Blessing being used when her team needs to engage/escape. There's not much that you can do to avoid her, but to pay attention to her abilities. After she uses Monolith, try to escape ASAP and see if she's not going to place Crushing Earth on you. Possible counters: Cursed Ankh, Heavenly Wings or Horrific Emblem. Xing Tian is an agressive god that can't stand with your kit. You can stop his ultimate by placing an Ice Wall and prevent him from initiating by using Frost Breath right after he uses his leap or his 2. Xing Tian's usual combo is: Hook Slam > Furious Roar, or Whirlwind of Rage and Steel > Hook Slam > Furious Roar, with Sky-Cutting Axe being used when needed. As said above, you should use Ice Wall and Frost Breath to prevent his abilities before he throws your entire team. -Gods that need to be close to lane in order to farm, such as Ravana and Tyr, Among others. -Gods who can easily escape from your CC, such as Chang'e and Kali, Among others. Ymir is a great, well balanced guardian that is capable of being Tanky and still dealing lots of damage. I hope that I achieved what I wanted with this guide, and don't forget to give your feedback! Goodbye and have a great day! -Changed "Defensive Support" build, now it only has 1 core item. Wow! -Changed the item's section overall design, maybe it's now easier to read. I need feedback about that! -"Matchups" section still outdated; working on it. -Added link to my Cernunnos guide! Ymir's beard needs no accessories. Also, how would you comb and trim a beard made out of ice, anyway? 122395 Technotoad64 Ymir's beard needs no accessories. Also, how would you comb and trim a beard made out of ice, anyway? With a comb/trimmer made of fire. 122426 boogiebass With a comb/trimmer made of fire. Thanks Boogie! Tbh, my Sobek guide build fits Ymir better than this one (I need to update it...). 122397 Bernardozomer Thanks Boogie! Tbh, my [[Sobek]] guide build fits [[Ymir]] better than this one (I need to update it...). 116883 sunny108108 great build for ymir! Updated guide for Season 4 (finally)! Though, most of the new text was transferred from my Sobek guide (with the needed adjustments being made). Item builds were almost totally reformulated. However, Support Matchups section will remain unchanged (outdated) for some time until I update it. 116531 Bernardozomer Updated guide for Season 4 (finally)! Though, most of the new text was transferred from my [[Sobek]] guide (with the needed adjustments being made). Item builds were almost totally reformulated. However, Support Matchups section will remain unchanged (outdated) for some time until I update it. 116992 Bernardozomer Updated Matchups section. Hey Bernard, nice to see you're still working on the guide. I like the item adjustments you've made. One thing I'll point out is that, currently, putting spoilers inside of spoilers doesn't work...basically, any spoilers inside are automatically opened when the original spoiler is opened. As such, my suggestion would be to get rid of the extra spoilers (e.g. "Further Information") and just make it a 2nd paragraph under each item. 113680 Branmuffin17 Hey Bernard, nice to see you're still working on the guide. I like the item adjustments you've made. One thing I'll point out is that, currently, putting spoilers inside of spoilers doesn't work...basically, any spoilers inside are automatically opened when the original spoiler is opened. As such, my suggestion would be to get rid of the extra spoilers (e.g. "Further Information") and just make it a 2nd paragraph under each item. Hey Bran, nice to see that you're still giving me feedback and that you liked the item adjustments. I made this to give more freedom to my build and to increase its effectiveness. I will change these spoilers inside spoilers soon. I'm still working on the guide because I want it to be in its "complete" form before creating a guide for another guardian. I was thinking about Sobek, as he doesn't have much guides and I like to play with him (I don't have even mastery 1 with him, though). I'm also going to update the Matchups and Gameplay section and maybe I will add a "Common Terms" section. I am also thinking of later expanding this guide to Joust too, as these (Along with Assault) are my favorite game modes. 113690 Bernardozomer Hey Bran, nice to see that you're still giving me feedback and that you liked the item adjustments. I made this to give more freedom to my build and to increase its effectiveness. I will change these spoilers inside spoilers soon. I'm still working on the guide because I want it to be in its "complete" form before creating a guide for another guardian. I was thinking about [[Sobek]], as he doesn't have much guides and I like to play with him (I don't have even mastery 1 with him, though). I'm also going to update the Matchups and Gameplay section and maybe I will add a "Common Terms" section. I am also thinking of later expanding this guide to Joust too, as these (Along with Assault) are my favorite game modes. Just so you don't give yourself too much work, I'd probably suggest skipping a common terms section...it is perhaps a bit more functional in broader guides (like my Overarching series), but for individual gods, I don't think it's as necessary. A joust build version would be nice, and you making a Sobek guide is great, as we definitely need a solid one for him...but suggest getting a bit more familiar with him to learn his tricks and whatnot before creating the guide. 113696 Branmuffin17 Just so you don't give yourself too much work, I'd probably suggest skipping a common terms section...it is perhaps a bit more functional in broader guides (like my Overarching series), but for individual gods, I don't think it's as necessary. A joust build version would be nice, and you making a [[Sobek]] guide is great, as we definitely need a solid one for him...but suggest getting a bit more familiar with him to learn his tricks and whatnot before creating the guide. Ok then, no Common Terms (it would be hard to try to fit it in somewhere, anyways). I will probably update it to Joust when S4 arrives, because for now I want to focus on learning and writing about Sobek. This guy is very funny to play. I think this guide is now almost complete (guides never are complete...). See ya later! 113730 Bernardozomer Ok then, no Common Terms (it would be hard to try to fit it in somewhere, anyways). I will probably update it to Joust when S4 arrives, because for now I want to focus on learning and writing about [[Sobek]]. This guy is very funny to play. I think this guide is now almost complete (guides never are complete...). See ya later! Hey Bernard, alrighty, now that the contest is over, if you don't mind, I'll comment a bit more. Don't know how much you've experimented, but for your Defensive Support build, my personal preference would be to choose only one of Breastplate of Valor and Genji's Guard. The specific reason for this is because as you get closer to max CDR, it becomes just a bit less important compared to some other stats...at least for me. With Shoes of Focus and BoV, you're already at 30%, and I think that a magical protection item that also offers a boost to health is a bit more important at that point. This opens you up to 3 solid alternatives... Bulwark of Hope for the largest health boost for personal function, Pestilence vs. any healers (self or group healing), and Heartward Amulet against 3 magical gods for teamfights are all solid options. Yes, Ymir has the highest base health, but that doesn't mean he won't benefit from added health...protections + health really add to your "effective health." Also, when you max CDR that early, you're pretty much blocking yourself from getting any other CDR item unless you're okay with inefficiencies in the build. If you don't get Genji, you can alternatively get Spirit Robe, or Mantle of Discord (with only 5% CDR inefficiency), and these are arguably better items than Genji. So...my preference would be BoV OR Genji, but not both. Against a magical heavy team or magical ADC, I might get Genji 2nd, and instead of BoV, get a physical item with counter function, such as Sovereignty, Witchblade, or Midgardian Mail. Regarding the Defensive Support start, Wards as starters aren't fully essential in my estimation. I think a more standard start (e.g. 4x Health Potion and Magical Potion) will allow you to stay out longer, but again, this is definitely personal preference, and you might do great with your start. I would follow that up with items like Ethereal Staff (you have that), Obsidian Shard (if you didn't get Void Stone), and more protection such as Mantle of Discord or Spirit Robe and any counter items. I don't suggest Gem of Isolation on Ymir, because his freeze is going to take up almost all of Gem's slow time...it'll help with extra slows when using Glacial Strike, but I think at that point there are better items than Gem. I will say I do love Gem, but I prefer it on Guardians like Bacchus. Remember this is my opinion, and your guide, so I'm just offering my suggestions and opinions. If you prefer your builds as they are, don't change them. Good job again on your guide and the work you've put into it. 113389 Branmuffin17 Hey Bernard, alrighty, now that the contest is over, if you don't mind, I'll comment a bit more. Don't know how much you've experimented, but for your Defensive Support build, my personal preference would be to choose only one of [[Breastplate of Valor]] and [[Genji's Guard]]. The specific reason for this is because as you get closer to max CDR, it becomes just a bit less important compared to some other stats...at least for me. With [[Shoes of Focus]] and BoV, you're already at 30%, and I think that a magical protection item that also offers a boost to health is a bit more important at that point. This opens you up to 3 solid alternatives...[[Bulwark of Hope]] for the largest health boost for personal function, [[Pestilence]] vs. any healers (self or group healing), and [[Heartward Amulet]] against 3 magical gods for teamfights are all solid options. Yes, [[Ymir]] has the highest base health, but that doesn't mean he won't benefit from added health...protections + health really add to your "effective health." The following is an old article, but it's still helpful: http://www.smitecentral.com/content/articles/page/professor-proxy/professor-proxy-intermediate-class-stone-of-gaia-bulwark-of-hope-pest Also, when you max CDR that early, you're pretty much blocking yourself from getting any other CDR item unless you're okay with inefficiencies in the build. If you don't get Genji, you can alternatively get [[Spirit Robe]], or [[Mantle of Discord]] (with only 5% CDR inefficiency), and these are arguably better items than Genji. So...my preference would be BoV OR Genji, but not both. Against a magical heavy team or magical ADC, I might get Genji 2nd, and instead of BoV, get a physical item with counter function, such as [[Sovereignty]], [[Witchblade]], or [[Midgardian Mail]]. Regarding the Defensive Support start, [[Ward]]s as starters aren't fully essential in my estimation. I think a more standard start (e.g. 4x [[Health Potion]] and [[Magical Potion]]) will allow you to stay out longer, but again, this is definitely personal preference, and you might do great with your start. For the Aggressive Support start, same applies with BoV and Genji...here are 2 core starts I would consider, in whichever order you need: [list][*][[Shoes of the Magi]], [[Breastplate of Valor]], [[Void Stone]] [*][[Shoes of Focus]], [[Dynasty Plate Helm]], [[Genji's Guard]][/list] I would follow that up with items like [[Ethereal Staff]] (you have that), [[Obsidian Shard]] (if you didn't get [[Void Stone]]), and more protection such as [[Mantle of Discord]] or [[Spirit Robe]] and any counter items. I don't suggest [[Gem of Isolation]] on [[Ymir]], because his freeze is going to take up almost all of Gem's slow time...it'll help with extra slows when using [[Glacial Strike]], but I think at that point there are better items than Gem. I will say I do love Gem, but I prefer it on Guardians like [[Bacchus]]. Remember this is my opinion, and your guide, so I'm just offering my suggestions and opinions. If you prefer your builds as they are, don't change them. Good job again on your guide and the work you've put into it. I don't remember who it was, but I'm pretty sure I saw that someone (maybe Variety?) in SWC built Breastplate of Valor and Genji's Guard back to back...granted, don't think it was Ymir, but either way someone did it. I thought that you had commented "I don't remember who it was, but I'm pretty sure I saw that someone already used this title". Oof, that was close (talking about it, did you liked?). You always let me confuseeeeed!!! EDIT: Looks like i messed up with the bbcode. Fixed! 114286 Bernardozomer I thought that you had commented "I don't remember who it was, but I'm pretty sure I saw that someone already used this title". Oof, that was close (talking about it, did you liked?). [quote]I don't remember who it was, but I'm pretty sure I saw that someone (maybe Variety?) in SWC built Breastplate of Valor and Genji's Guard back to back...[/quote] [center]You always let me confuseeeeed!!! [/center] But I agree with you, balance is always a safer and a better choice for us, mere mortals... P.S. : Congrats for the moderator [rank?] EDIT: Looks like i messed up with the bbcode. Fixed! After seeing that, I just felt I needed to mention it to you to give you some credit, as I'd suggested specifically against that...I know that SWC and skill levels are way different, and people weren't following "meta," but still. Again, I'd never build that myself, because I need all the health I can get, but for those that can make it work, maybe it's not a bad strat...? 114287 Branmuffin17 After seeing that, I just felt I needed to mention it to you to give you some credit, as I'd suggested specifically against that...I know that SWC and skill levels are way different, and people weren't following "meta," but still. Again, I'd never build that myself, because I need all the health I can get, but for those that can make it work, maybe it's not a bad strat...? Hi again, Bran (it rhymes!)! About the effective health; I think you are right. After the contest ended I started to think if Genji's was or wasn't a good option... I'm going to change the core to be only Shoes of Focus and then either Breastplate of Valor or Sovereignty, I can't decide yet... Sov gives 320 effective health with the passive (I hope I did the math right), and BoV gives 0 health, so if i had to choose BoV i would probably follow with Bulwark of Hope, and if i had to go with Sov I would then buy Genji's for the CDR. Then, a section for magical protection with Bulwark of Hope, Heartward Amulet and Genji's Guard. By following this formula: Effective health = Health / (100/(100+Protections)) I calculated that BoH gives 320 Effective Health, as SoV do; And that Heartward Amulet gives 330. So, if someone buy BoV instead of Sov, it would make a lot of sense to choose between these two. About the starter Wards, they have actually saved me a bunch of times in casuals. I rarely play ranked, so I don't know if they have crazy junglers there... But maybe 4x Multi Potions could help more. About the A. Support Build: I see a lot of guides with Dynasty Plate Helm and Void Stone being used in agressive support builds, but I mostly play defensively when playing support (and considering I main support, that is a lot), so I don't know about the actual effects of these items. I will test them later and see how they proceed. Awesome...I didn't do the math myself, but sounds pretty good to me. Yeah, the thing is balancing stats...maxing CDR on Ymir may not be as important as other things...but if YOU decide CDR is absolutely important, then just figure out how much is optimal at what stage of the match. When considering the balance of those protection item combos, just remember their different foci and what they bring to the table. BoV and BoH are a great combo for selfish stats, Sov and Heart are great for teammates (and for sustain over longer periods of time due to the HP5/MP5), etc. Mixing it up is fine too...Any shoes + BoV + Heart would work especially well against a team with 3 magical gods, while Shoes of Focus + Sovereignty + Genji's Guard would be a good starting balance of CDR and team physical protection, should you choose to go that route. Starter Wards...huh...maybe that's why in some games I'm going uh...guys...why is the mid crashing our party? Warning, anyone? And that's with my normal clanmates lol. But the early sustain is just too nice...though lately I've been finding that I haven't needed all of the potions as much. I would just worry about running out of health/mana quickly, especially with Multi Potion. For aggressives...those items are nice. Really, though, in Conquest, I wouldn't go both of those items...I'd choose one for early aggression, but get a more standard support item to balance things...the time when I go Shoes of the Magi + Dynasty Plate Helm + Void Stone is when I'm playing Joust/Siege/Arena/Clash and going cheap damage for early dominance. 113421 Branmuffin17 Hey Bernard, Awesome...I didn't do the math myself, but sounds pretty good to me. Yeah, the thing is balancing stats...maxing CDR on [[Ymir]] may not be as important as other things...but if YOU decide CDR is absolutely important, then just figure out how much is optimal at what stage of the match. When considering the balance of those protection item combos, just remember their different foci and what they bring to the table. BoV and BoH are a great combo for selfish stats, Sov and Heart are great for teammates (and for sustain over longer periods of time due to the HP5/MP5), etc. Mixing it up is fine too...Any shoes + BoV + Heart would work especially well against a team with 3 magical gods, while [[Shoes of Focus]] + [[Sovereignty]] + [[Genji's Guard]] would be a good starting balance of CDR and team physical protection, should you choose to go that route. Starter [[Ward]]s...huh...maybe that's why in some games I'm going uh...guys...why is the mid crashing our party? Warning, anyone? And that's with my normal clanmates lol. But the early sustain is just too nice...though lately I've been finding that I haven't needed all of the potions as much. I would just worry about running out of health/mana quickly, especially with [[Multi Potion]]. For aggressives...those items are nice. Really, though, in Conquest, I wouldn't go both of those items...I'd choose one for early aggression, but get a more standard support item to balance things...the time when I go [[Shoes of the Magi]] + [[Dynasty Plate Helm]] + [[Void Stone]] is when I'm playing Joust/Siege/Arena/Clash and going cheap damage for early dominance. Just updated the guide with all you said (Or almost it... I'm going to release V. 1.5.1 soon)! The more you comment, the better my guide becomes. Alright Bernard, here's another comment to improve your guide...photoshop a picture of Ymir with a Speedo on, and use that as your cover picture. Boom! 113454 Branmuffin17 Alright Bernard, here's another comment to improve your guide...photoshop a picture of [[Ymir]] with a Speedo on, and use that as your cover picture. Boom! Note: just to mention that i updated the guide for v. 1.6! 113463 Bernardozomer LOL, that's a good ideia. At least if i knew how to photoshop... Oh, and I still don't know how you guys appear from nowhere... Note: just to mention that i updated the guide for v. 1.6! Good to know about Dynasty Plate Helm and Void Stone. Working on V. 1.5! 113423 Bernardozomer Good to know about [[Dynasty Plate Helm]] and [[Void Stone]]. Working on V. 1.5! Changelog is now on the guide's bottom! 113380 Bernardozomer Changelog is now on the guide's bottom! If im gonna review, I gotta do it right. Build wise, awesome. Can't judge you on that. You covered all the points, and builds are subjective, but you need to defend them. As a whole, very Zilby-like. You did say that he did play a part in helping you with the template. In the future, tho, mess around with the coding and teach yourself so you can develop your own sort of style and signature. I mean, every Bran guide has a MS paint header, and every Prism guide has a sign off with a cool skin. Me, I am starting to do this fun thing on the side with hidden messages. I was wondering why you do have a solo build. I have not seen a Ymir solo, nor is it in the Spl, correct me. For one, Ymir doesnt have huge sustain like heals or protections steals, and his main damage and CC is too up close. Also, his mobility and kit is too clunky and has no escape, and while it all does fit this theme of icy and snow with stuns and slows (bars), it doesn't scream Solo. By that alone, he is beat by almost every warrior, and some mages. However, the general tips you left were helpful to get new players into the this new solo idea. Overall, great guide, considering its your first. Don't change anything until after the judging period. Don't think you'll have enough time, and don't wanna stress you. GLHF in the future. +1. 113157 IceColdPappsi If im gonna review, I gotta do it right. Build wise, awesome. Can't judge you on that. You covered all the points, and builds are subjective, but you need to defend them. As a whole, very Zilby-like. You did say that he did play a part in helping you with the template. In the future, tho, mess around with the coding and teach yourself so you can develop your own sort of style and signature. I mean, every Bran guide has a MS paint header, and every Prism guide has a sign off with a cool skin. Me, I am starting to do this fun thing on the side with [color=Transparent]hidden messages. [/color] I was wondering why you do have a solo build. I have not seen a Ymir solo, nor is it in the Spl, correct me. For one, Ymir doesnt have huge sustain like heals or protections steals, and his main damage and CC is too up close. Also, his mobility and kit is too clunky and has no escape, and while it all does fit this theme of icy and snow with stuns and slows (bars), it doesn't scream Solo. By that alone, he is beat by almost every warrior, and some mages. However, the general tips you left were helpful to get new players into the this new solo idea. Overall, great guide, considering its your first. Don't change anything until after the judging period. Don't think you'll have enough time, and don't wanna stress you. GLHF in the future. +1. Sorry Papps, gonna point out one more thing...Ducks' guide. Regarding Zilby's template...he made it directly available in guide format for others to use if they wanted. But yes, always best to develop your own. But as a first-time guide maker, and with limited time to learn coding, I'd say Bernard (and all of the other newer members with submissions) is at a disadvantage to others, who have already made guides before, gotten feedback, and have more experience at it. So using a base template at first is probably the smartest idea...and of course, everyone has lives outside of SMITE. I think. What I sort of am most interested about is the feeling from all of the contributors, especially the newer ones. I'll probably ask that separately. 113159 Branmuffin17 Sorry Papps, gonna point out one more thing...Ducks' guide. http://www.smitefire.com/smite/guide/squeezing-loving-george-may-or-may-not-be-included-ymir-guide-s3-solo-jungle-14929 Pro scene...Variety of Obey Alliance (EU): http://esports.smitegame.com/player/variety/ Regarding Zilby's template...he made it directly available in guide format for others to use if they wanted. http://www.smitefire.com/smite/guide/a-template-for-guides-11963 But yes, always best to develop your own. But as a first-time guide maker, and with limited time to learn coding, I'd say Bernard (and all of the other newer members with submissions) is at a disadvantage to others, who have already made guides before, gotten feedback, and have more experience at it. So using a base template at first is probably the smartest idea...and of course, everyone has lives outside of SMITE. I think. What I sort of am most interested about is the feeling from all of the contributors, especially the newer ones. I'll probably ask that separately. I definitely wouldn't criticize someone for using a template, as long as your guide is clean and the bbcode makes it readable and easy to access the information, there's really nothing to complain about. Admittedly adding some embellishments can be a nice touch, but in terms of how important that is, it's probably at the bottom end of the spectrum. I mean even for my first guide I used OmgAsia's guide as a sort of makeshift template for myself to lay out my Nox guide. Of course since then my guide changed quite a bit so you can't see what it looked like back then, but it was writing that guide that made me realize how helpful it can be to utilize a template for creating your first guide (especially since back then without my template guide I had to figure out all the bbcode myself and the end result took way longer because of this). @Bernardozomer only real recommendation I can make is regarding your skill order for the aggressive support and solo build. In solo especially, I would prioritize Glacial Strike over Frost Breath, leveling it up at level 6 and 7 and getting it to max level at level 10. In solo this really helps you clear the wave more easily (and not have to burn two abilities to do so) and in support this really lets you use your Shoes of the Magi to deal a lot of damage to the enemy with Glacial Strike's base damage. If you choose Shoes of Focus or other shoes like in your more defensive build, it can be nice to level up Frost Breath a little earlier for the extra CC so that your ADC can do more damage to your enemy and to keep them locked down for longer, but otherwise I would wait to level that ability up next. 113160 Zilby I definitely wouldn't criticize someone for using a template, as long as your guide is clean and the bbcode makes it readable and easy to access the information, there's really nothing to complain about. Admittedly adding some embellishments can be a nice touch, but in terms of how important that is, it's probably at the bottom end of the spectrum. I mean even for my first guide I used OmgAsia's guide as a sort of makeshift template for myself to lay out my [[nox]] guide. Of course since then my guide changed quite a bit so you can't see what it looked like back then, but it was writing that guide that made me realize how helpful it can be to utilize a template for creating your first guide (especially since back then without my template guide I had to figure out all the bbcode myself and the end result took way longer because of this). @Bernardozomer only real recommendation I can make is regarding your skill order for the aggressive support and solo build. In solo especially, I would prioritize [[glacial strike]] over [[frost breath]], leveling it up at level 6 and 7 and getting it to max level at level 10. In solo this really helps you clear the wave more easily (and not have to burn two abilities to do so) and in support this really lets you use your [[shoes of the magi]] to deal a lot of damage to the enemy with [[glacial strike]]'s base damage. If you choose [[shoes of focus]] or other shoes like in your more defensive build, it can be nice to level up [[frost breath]] a little earlier for the extra CC so that your ADC can do more damage to your enemy and to keep them locked down for longer, but otherwise I would wait to level that ability up next. I can't deny that my guide is "Zilby-like", but that is because i have never even heard about bb coding before November 10th; So then i used his templates (That reeeally helped, now i know how to bb-code some things). But in my future guides and updates to this one I'm going to change some visuals. About the Solo Ymir, as Bran stated, it is much more common than it seems. And it really works! First time I used my Ymir Solo build I stole FG and got a Triple Kill! But you have to play safely against solo-laners that can clear from a distance. About the skill order: Yes, I think I should have maxed Glacial Strike at level 10 on the Solo Build, but not in the A. Supp. Build, because it is still a support build with more damage. But that doesn't means it should be leveled always this way. Thanks you all for the feedback! Just to clarify, never said getting help in BBCoding was bad. #xZeroStrike. I'm just saying that you want people to recognize your style and who you are as a guide creator. It might take a while, but you will eventually develop a signature of sorts. It's not a priority, tho, so don't worry about it. Go to homepage, then forums, then news, and its the first one. Solo Ymir, huh? Gotta try that sometime. 113174 IceColdPappsi Just to clarify, never said getting help in BBCoding was bad. #xZeroStrike. I'm just saying that you want people to recognize your style and who you are as a guide creator. It might take a while, but you will eventually develop a signature of sorts. It's not a priority, tho, so don't worry about it. Go to homepage, then forums, then news, and its the first one. Solo Ymir, huh? Gotta try that sometime. Updated the guide with lots of changes! Mostly thankfully to Branmuffin17! 113024 Bernardozomer Updated the guide with lots of changes! Mostly thankfully to [color=#00ff00]Branmuffin17[/color]! Updated guide again, now with SOLO LANE BUILD! Go check it out! 113101 Bernardozomer Updated guide again, now with [b]SOLO LANE BUILD! [/b] Go check it out! Updated once more, now with GAMEPLAY TIPS and MATCHUPS sections! 113135 Bernardozomer Updated once more, now with [b]GAMEPLAY TIPS[/b] and [b]MATCHUPS[/b] sections! Yes, I think the system automatically categorizes any guides over 1,000 characters as a guide, rather than just a build. If you go to the main Ymir page, it has a list of guides for that god, starting with full S3 guides, then S3 builds, then older guides below that. You're in the guide category, and you're plenty over the 1,000 character minimum. As for wards, I think they look generally fine. I would say that there is one other general section that can be useful, if you can sneak them in without the enemy seeing...right in front of their towers...since there's a lot of traffic that can go through the mid-lane, getting that junction can help give you early warning where the enemy can be heading. But yeah, looks solid to me. 113020 Branmuffin17 Yes, I think the system automatically categorizes any guides over 1,000 characters as a guide, rather than just a build. If you go to the main [[Ymir]] page, it has a list of guides for that god, starting with full S3 guides, then S3 builds, then older guides below that. You're in the guide category, and you're plenty over the 1,000 character minimum. As for wards, I think they look generally fine. I would say that there is one other general section that can be useful, if you can sneak them in without the enemy seeing...right in front of their towers...since there's a lot of traffic that can go through the mid-lane, getting that junction can help give you early warning where the enemy can be heading. But yeah, looks solid to me. Updated the Warding section as you said (at least i think it's now correct)! 113139 Bernardozomer Updated the Warding section as you said (at least i think it's now correct)! Welcome, and thanks for participating in the contest. For now, I'm just going to point out a significant issue with your build(s). It's about CDR...there's a max cap of 40%. In your Defensive build, your 3 core items get you to that cap. If you do consider these "core," then all items past that point should not have CDR, unless there's a specific passive you just absolutely can't pass up for other reasons. So, your option of Spirit Robe and Mantle of Discord both blow you past the cap. In your Aggressive build, it's not quite as bad, but your "damage" option outside of your core has Pythagorem's Piece, which would put you at the cap...and then also Mantle of Discord again, as an option for item #6. Build efficiency is important to consider, so just want to make sure you're aware of this. Hope this helps! 112931 Branmuffin17 Hi Bernard, Welcome, and thanks for participating in the contest. For now, I'm just going to point out a significant issue with your build(s). It's about CDR...there's a max cap of 40%. In your Defensive build, your 3 core items get you to that cap. If you do consider these "core," then all items past that point should not have CDR, unless there's a specific passive you just absolutely can't pass up for other reasons. So, your option of [[Spirit Robe]] and [[Mantle of Discord]] both blow you past the cap. In your Aggressive build, it's not quite as bad, but your "damage" option outside of your core has [[Pythagorem's Piece]], which would put you at the cap...and then also [[Mantle of Discord]] again, as an option for item #6. Build efficiency is important to consider, so just want to make sure you're aware of this. Hope this helps! First of all, thanks for the feedback. I REALLY aprecciate it. As for Spirit Robe, for me, the best part of the item is its passive, that work very well against high-CC enemy comps, and, in my opinion, better than Magi's Blessing. Plus, 40 Physical and Magical protections can really help. However, I would only suggest buying this if you are dying because of CC and/or your team is behind, so you won't be able to stack Hide of the Urchin. As for Mantle of Discord, it gives you 60 Physical and Magical protections, so whenever i can, i buy this item. Plus, it has a really helpful passive. I noticied you said "For now, I'm just going to point out a significant issue with your build(s)." so i think this means my build has some more issues. One of those may be that counterbuilding as 5-6 item(s) is too late, i'm going to change this order a bit. So if there are more issues and/or typos (English is not my mother language) then please, tell me! It really helps! 112961 Bernardozomer Hi, [b]Branmuffin17[/b]! First of all, thanks for the feedback. I REALLY aprecciate it. As for [[Spirit Robe]], for me, the best part of the item is its passive, that work very well against high-CC enemy comps, and, in my opinion, better than [[Magi's Blessing]]. Plus, 40 Physical and Magical protections can really help. However, I would only suggest buying this if you are dying because of CC and/or your team is behind, so you won't be able to stack [[Hide of the Urchin]]. As for [[Mantle of Discord]], it gives you 60 Physical and Magical protections, so whenever i can, i buy this item. Plus, it has a really helpful passive. As for [[Pythagorem's Piece]], i am thinking of removing it from my build, as its Lifesteal and CDR are a waste of space, and its passive doesn't seem [i]that[/i] good... I noticied you said "For now, I'm just going to point out a significant issue with your build(s)." so i think this means my build has some more issues. One of those may be that counterbuilding as 5-6 item(s) is too late, i'm going to change this order a bit. So if there are more issues and/or typos (English is not my mother language) then please, tell me! It really helps! Hey Bernard, I'm trying not to influence builds too much, so other than pointing out potential issues, I don't want to suggest alternatives...it's your guide, so it's your decision in the end. I just was a bit busy so didn't read everything you wrote...I will do so later and give a bit more feedback. Didn't specifically mean there were other issues with the build...just wanted to point out my first thoughts. I will say that it's really a better idea not to overcap. This is because each item has a set number of stats...and you're paying for them. If part of what you buy doesn't function for you, it's bringing in inefficiencies, and you're not only paying for more than you get, but you're also losing out on other things that you could get with other items. I absolutely understand the qualities that Spirit and Discord provide...but you might need to consider which ones you value most, and just deal with the loss of the others. Anyway, will follow up more later. 112963 Branmuffin17 Hey Bernard, I'm trying not to influence builds too much, so other than pointing out potential issues, I don't want to suggest alternatives...it's your guide, so it's your decision in the end. I just was a bit busy so didn't read everything you wrote...I will do so later and give a bit more feedback. Didn't specifically mean there were other issues with the build...just wanted to point out my first thoughts. I will say that it's really a better idea not to overcap. This is because each item has a set number of stats...and you're paying for them. If part of what you buy doesn't function for you, it's bringing in inefficiencies, and you're not only paying for more than you get, but you're also losing out on other things that you could get with other items. I absolutely understand the qualities that Spirit and Discord provide...but you might need to consider which ones you value most, and just deal with the loss of the others. Anyway, will follow up more later. 112967 Bernardozomer Now I'm thinking of changing Genji's by [[Oni Hunter's Garb]], as it was buffed in this patch and would work in losing or winning scenarios. However, i didn't tested it and I don't know if it is as good as it seems... Until later! Of the 4 CDR items you list in Defensive, I personally feel that Genji's Guard is perhaps the least important...not everyone agrees with me, though, and it's best that you determine your own preference. Oni Hunter's Garb does provide a HUGE protection boost at full stacks, but I've never used it. Other than the CDR comment, I don't see any specific issues with the item options overall, and again, I don't want to influence builds...it has to be your build. So we'll get into the rest of your guide. One minor thing that I think still applies...you talk about Ice Wall placed at your feet, and I think that's generally accurate still. However, if you don't have your full tier 3 shoes, or if you're slowed, well, I'm not sure you still can get past it as it goes up. Might be worth double-checking. In your D Support item explanation, minor correction...BoV provides 300, not 200 mana. In your Spirit Robe explanation, you point out that it gives more D than Urchin...but that's only temporary and not sure I'd use that comparison favorably. I'd point out the CDR and passive as being more important...but perhaps only if you got something else than Genji's Guard (as that maxes CDR at that point). One quick hint (for any other Ymir guide makers that read this as well), Hide of the Nemean Lion is often a good choice specifically against hunters and assassins building crit (that damage reflect really hurts them). Witchblade is perhaps better vs hunters building Qin's Sais...Midgard is also okay, but higher health = more effective Qin's. Midgard is a good choice when facing Freya or other magical ADCs, maybe...eh, I'm not sure about all that. Ignore if you want. Only going to say one thing about Gem of Isolation...think about the passive, and the length of time it lasts compared to your abilities. WHY do you think Pythagorem's Piece may be helpful in certain situations? Just because? Mind explaining thoughts further, and in which situations you see it helping? Anyway, that's pretty much it for me. Want everyone's guides to be submitted on their own merit, so...just make sure you explain your thoughts as clearly as possible, and good luck in the contest. 112985 Branmuffin17 Alrighty, Of the 4 CDR items you list in Defensive, I personally feel that [[Genji's Guard]] is perhaps the least important...not everyone agrees with me, though, and it's best that you determine your own preference. [[Oni Hunter's Garb]] does provide a HUGE protection boost at full stacks, but I've never used it. Other than the CDR comment, I don't see any specific issues with the item options overall, and again, I don't want to influence builds...it has to be your build. So we'll get into the rest of your guide. In the "Pros" section, not sure what you're saying about [[Ares]]... One minor thing that I think still applies...you talk about [[Ice Wall]] placed at your feet, and I think that's generally accurate still. However, if you don't have your full tier 3 shoes, or if you're slowed, well, I'm not sure you still can get past it as it goes up. Might be worth double-checking. In your D Support item explanation, minor correction...BoV provides 300, not 200 mana. In your [[Spirit Robe]] explanation, you point out that it gives more D than Urchin...but that's only temporary and not sure I'd use that comparison favorably. I'd point out the CDR and passive as being more important...but perhaps only if you got something else than [[Genji's Guard]] (as that maxes CDR at that point). One quick hint (for any other [[Ymir]] guide makers that read this as well), [[Hide of the Nemean Lion]] is often a good choice specifically against hunters and assassins building crit (that damage reflect really hurts them). [[Witchblade]] is perhaps better vs hunters building [[Qin's Sais]]...Midgard is also okay, but higher health = more effective Qin's. Midgard is a good choice when facing [[Freya]] or other magical ADCs, maybe...eh, I'm not sure about all that. Ignore if you want. Only going to say one thing about [[Gem of Isolation]]...think about the passive, and the length of time it lasts compared to your abilities. WHY do you think [[Pythagorem's Piece]] may be helpful in certain situations? Just because? Mind explaining thoughts further, and in which situations you see it helping? Anyway, that's pretty much it for me. Want everyone's guides to be submitted on their own merit, so...just make sure you explain your thoughts as clearly as possible, and good luck in the contest. About Oni Hunter's Garb, it starts out with 60 protections, because you buy it at full stacks, and when you take damage, you lose 6 of them. It may be confusing from reading the description and thinking 120 magical protections is broken, but in game, the protections are not listed as a stat, but are there when bought, and lost after taking damage. 113140 IceColdPappsi About [[Oni Hunter's Garb]], it starts out with 60 protections, because you buy it at full stacks, and when you take damage, you lose 6 of them. It may be confusing from reading the description and thinking 120 magical protections is broken, but in game, the protections are not listed as a stat, but are there when bought, and lost after taking damage. Everything you've said here is completely wrong. 113145 CakeSlapping Everything you've said here is completely wrong. Sorry. Had to reread it. Pls correct me if this is better. It does provide 50 magical protections, and when you take damage, 10 are removed, and they will come back in 6 seconds, but does not provide 100 magical protections in total. 113148 IceColdPappsi Sorry. Had to reread it. Pls correct me if this is better. It does provide 50 magical protections, and when you take damage, 10 are removed, and they will come back in 6 seconds, but does not provide 100 magical protections in total. Per tooltip... Oni Hunter's Garb provides a base 60 magical protection. Each 6 seconds, you gain an additional 10 magical protection (max 5 stacks). This means, if you haven't taken magical damage for 30 seconds, your magical protection contribution from this item is 110. 110!!! Welp, I'm done. And people said Hide, Valor, and Bulwark were the best items. 113151 IceColdPappsi Welp, I'm done. And people said Hide, Valor, and Bulwark were the best items. Hey Pappsi! I forgot to ask what are your thoughts on my guide. Until next time! 113152 Bernardozomer Hey Pappsi! I forgot to ask what are your thoughts on my guide. Until next time! Now i am truly confused. 113147 Bernardozomer Now i am [b][i]truly[/i][/b] confused. Ymir can cancel Ares' chains and flames by freezing him, and both his chains and his ult doesn't go through walls. Plus, as Ares has no scape, by just doing your simple combo late-game he is dead. About Ice Wall: tested it on Jungle Practice and you can't do the escape trick with Tier 1 boots, neither while slowed (tested with Ra's... I think it is 40%, right? ), thanks for pointing that! About the Spirit Robe, i said "Yes, it is more expensive than Hide of the Urchin, but it's only 60 more gold and it gives more defense (assuming you can't stack it)." However, Urchin outpasses Spirit Robe in two stacks (it is not that difficult to stack it) so i will change this part. About the Gem: I was thinking of mentioning that the first slow is 60% and the second 35% (2s each), but i haven't written it... now i updated it! After reanalizing Phytagorem's Piece, i understood that it's Lifesteal and CDR wouldn't be helpful, assuming you bought Genji's, and as the majority of matches have 3 Physical damage dealers and 2 Magical ones (Hunters, Assassins and Warriors; Mages and Guardians) it would be a very specific item. So because of this, i removed it entirely from my build. Thanks and see you later! 112994 Bernardozomer Hi again! [[Ymir]] can cancel [[Ares]]' chains and flames by freezing him, and both his chains and his ult doesn't go through walls. Plus, as Ares has no scape, by just doing your simple combo late-game he is dead. About [[Ice Wall]]: tested it on Jungle Practice and you can't do the escape trick with Tier 1 boots, neither while slowed (tested with Ra's... I think it is 40%, right? ), thanks for pointing that! About the [[Spirit Robe]], i said [b][i]"Yes, it is more expensive than [[Hide of the Urchin]], but it's only 60 more gold and it gives more defense ([u]assuming you can't stack it[/u]). "[/i][/b] However, Urchin outpasses Spirit Robe in two stacks (it is not that difficult to stack it) so i will change this part. About the Gem: I was thinking of mentioning that the first slow is 60% and the second 35% (2s each), but i haven't written it... now i updated it! After reanalizing [[Phytagorem's Piece]], i understood that it's Lifesteal and CDR wouldn't be helpful, assuming you bought Genji's, and as the majority of matches have 3 Physical damage dealers and 2 Magical ones (Hunters, Assassins and Warriors; Mages and Guardians) it would be a very specific item. So because of this, i removed it entirely from my build. Thanks and see you later! Hey Bernard, because I'm not certain about this, please clarify? You say Ymir can "cancel" Ares chains and flames. Using that term, to me, means that it just automatically stops the ability. Depending on you confirming effects below, the better term might be "counters." Regarding Searing Flesh, because I just can't remember right now...does it actually STOP the flames when you freeze him mid-ability? Or does it just freeze him, with his flames still going off, allowing you/teammates to create separation? Regarding his Ice Wall, does it block the flames from getting through? Or just his movement? Pretty sure it blocks the damage, but not sure. Regarding Shackles, pretty sure the term for the immediate effect wouldn't be cancel...don't think freezing him makes the chains go away. Rather, prevents him from chaining multiple shackles, and again allowing people to create enough separation to move outside the range of shackles. In the same vein, I think Ice Wall dropped in the middle of an existing chain won't cancel it...just prevent him from easily confirming another shackle. And check your term for canceling Ares in the Pros...it says "hardly" which is essentially "barely." That was partly what I was meaning in the initial comment. 112996 Branmuffin17 Hey Bernard, because I'm not certain about this, please clarify? You say [[Ymir]] can "cancel" [[Ares]] chains and flames. Using that term, to me, means that it just automatically stops the ability. Depending on you confirming effects below, the better term might be "counters." Regarding [[Searing Flesh]], because I just can't remember right now...does it actually STOP the flames when you freeze him mid-ability? Or does it just freeze him, with his flames still going off, allowing you/teammates to create separation? Regarding his [[Ice Wall]], does it block the flames from getting through? Or just his movement? Pretty sure it blocks the damage, but not sure. Regarding [[Shackles]], pretty sure the term for the immediate effect wouldn't be cancel...don't think freezing him makes the chains go away. Rather, prevents him from chaining multiple shackles, and again allowing people to create enough separation to move outside the range of shackles. In the same vein, I think [[Ice Wall]] dropped in the middle of an existing chain won't cancel it...just prevent him from easily confirming another shackle. Mind confirming? And check your term for canceling [[Ares]] in the Pros...it says "hardly" which is essentially "barely." That was partly what I was meaning in the initial comment. Ares is a predictable god, even more without Blink, and he probably won't pick it as first relic because it has one of the lowest defenses among the guardians. So, at least early game, he needs to walk towards you and use his abilities. this way, Ymir can freeze him before he uses his abilities or when he already used it, because if Ymir use Frost Breath while Ares is using Searing Flesh, the flames are canceled (they stop from going off). And yes, you are right about Shackles. Plus, if the chained god walks some distance away, the shackles go off. So, if Ymir do his simple combo, maybe (depending of the situation) he could get of of his shackles, and/or preventing him from chaining another shackle AND preventing him from engaging with No Escape, assuming he doesn't have Blink yet (Ares' ult can't go trough Ice Wall if the wall is placed before he uses it). Plus, as Ares have such low mobility and any escape ability, Ymir's basic combo is ultra hard against him. As for the term I used, may I have overrated his counter to Ares... but it is still a strong counterpick! 113014 Bernardozomer Hi again, Bran! I think I misunderstood some information: [[Ares]] is a predictable god, even more without [[Blink]], and he probably won't pick it as first relic because it has one of the lowest defenses among the guardians. So, at least early game, he needs to walk towards you and use his abilities. this way, Ymir can freeze him before he uses his abilities or when he already used it, because if [[Ymir]] use [[Frost Breath]] while [[Ares]] is using [[Searing Flesh]], the flames are canceled (they stop from going off). And yes, you are right about [[Shackles]]. Plus, if the chained god walks some distance away, the shackles go off. So, if [[Ymir]] do his simple combo, [i]maybe[/i] (depending of the situation) he could get of of his shackles, and/or preventing him from chaining another shackle [b]AND[/b] preventing him from engaging with [[No Escape]], assuming he doesn't have [[Blink]] yet (Ares' ult can't go trough [[Ice Wall]] if the wall is placed before he uses it). Plus, as Ares have such low mobility and any escape ability, Ymir's basic combo is ultra hard against him. As for the term I used, may I have overrated his counter to Ares... but it is still a strong counterpick! Awesome, thanks for the clarification...good to confirm a freeze does shut off his flames. And yes, predictable movement + freeze means he's definitely easy to at least deflect the majority of his potential. 113016 Branmuffin17 Awesome, thanks for the clarification...good to confirm a freeze does shut off his flames. And yes, predictable movement + freeze means he's definitely easy to at least deflect the majority of his potential. Just another question: does my guide has 1000+ characters? And what do you think about the warding section? 113018 Bernardozomer Just another question: does my guide has 1000+ characters? And what do you think about the warding section?